Ben Lomond in 1976 during the fateful restoration. Goochland’s Ben Lomond is named after a mountain on the banks of Loch Lomond in Scotland. The name Ben Lomond comes from the Scottish Gaelic Beinn Laomainn which translates to Beacon Mountain. In 1736, Isham Randolph, Sr. of Turkey Island in Henrico County, was granted a Royal Patent for 3,000 acres in Goochland County. It was on a part of this land that he built his mansion, Dungeness. Isham’s grandson, Archibald Cary Randolph bought the property that comprises Ben Lomond from the Dungeness estate in the late 1700’s and built his own house. An 1801 insurance policy shows that the original house was roughly the size of the central portion of the house as shown in the picture above. One of Randolph’s passions was horses and it was on this farm that famed racehorse Sir Archie was foaled in 1805. In 1806, Archibald Cary Randolph was forced to sell Ben Lomond and his horses to pay debts. Archibald was also known to be particularly bad with money. In a case heard before the Supreme Court, Archibald along with his two brothers, were said to be “notoriously insolvent” and had wasted their father’s estate. Archibald sent Sir Archie went to his partner William Tayloe and Ben Lomond was sold to Benjamin Watkins. The property passed down through the Watkins family for several generations and then went through a succession of owners: Van Mater, Schuett, Hazelwood, Rutherfoord, Bremner, Lewis, Hicks, Woodruff and Liebert to name a few. The house has been described as a two-story, central passage plan house that was popular in the eighteenth century. 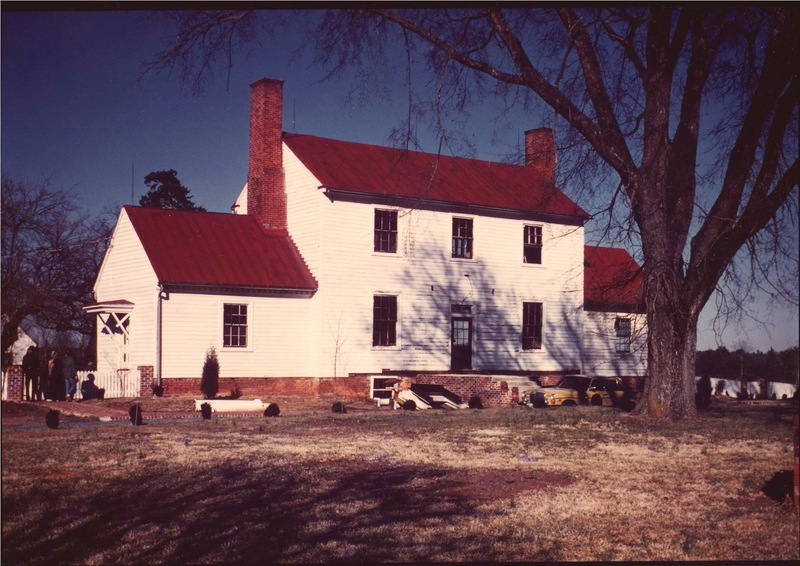 Houses built in a similar style in Goochland include Tuckahoe, Rock Castle. In the 1970’s, Ben Lomond was undergoing an extensive restoration and renovation project when it caught fire. Neighbors could only stand in awe as the historic structure succumbed to the intense heat before the fire department could arrive. 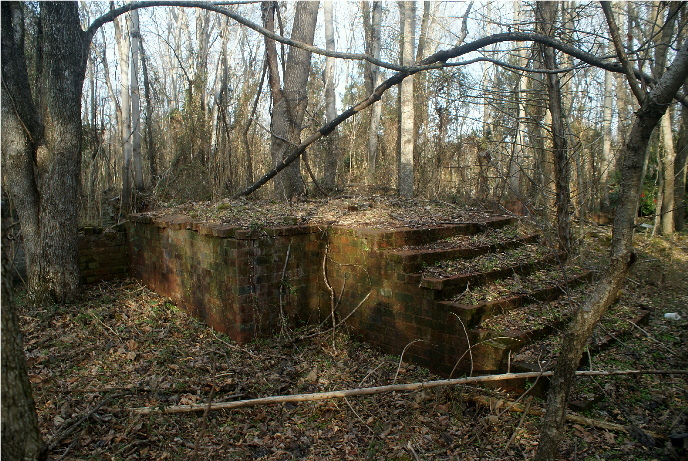 All that remains today is the western chimney, brick foundation and the steps. Strewn amongst the ground cover are fallen bricks from the massive eastern chimney, broken glass and pieces of metal. Two beautiful magnolia trees and scattered boxwoods give evidence of the park-like grounds that must have once existed. A few crumbling outbuildings stand as reminders of the once magnificent farm are slowly following the manor house into oblivion. 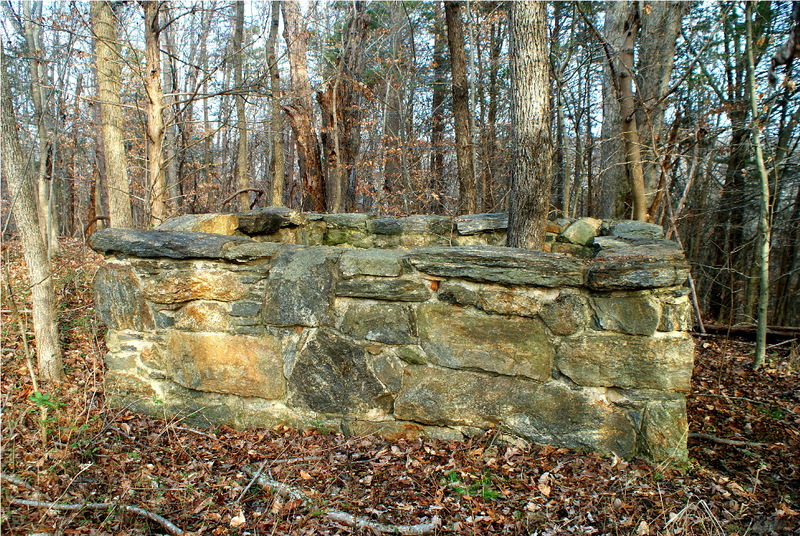 Past the decimated structure and just beyond the edge of the wood line is a square stone wall, the age of which is unknown. Inside this enclosure is speculated to be the grave of Sir Archie (1803-1833). He was the greatest racehorse of his day and sired many champions in his years at stud. His line went on to produce Man O’War, Seabiscuit and Secretariat to name just a few. Part of the mystery surrounding Sir Archie is his burial place. 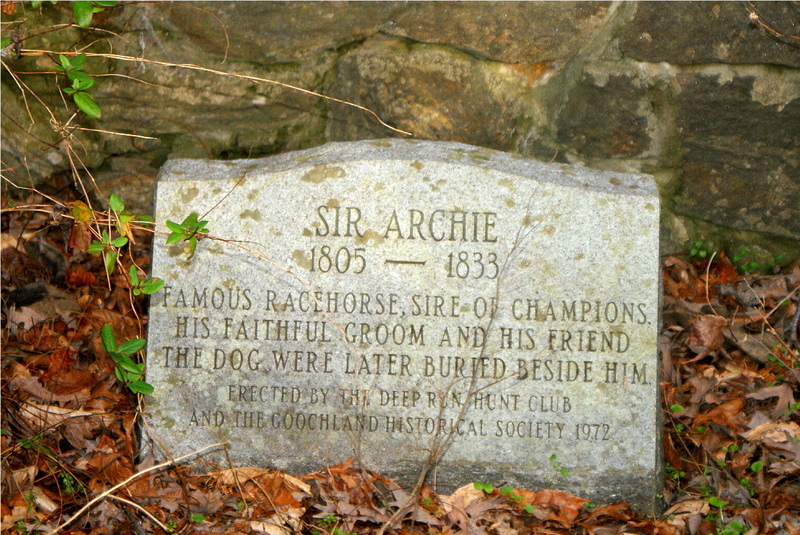 Sir Archie spent his last 17 years at stud at Mowfield Plantation, just west of Jackson, North Carolina which also lays claim as his place of burial. For decades, this has been a heated debate. Burial place of Sir Archie? 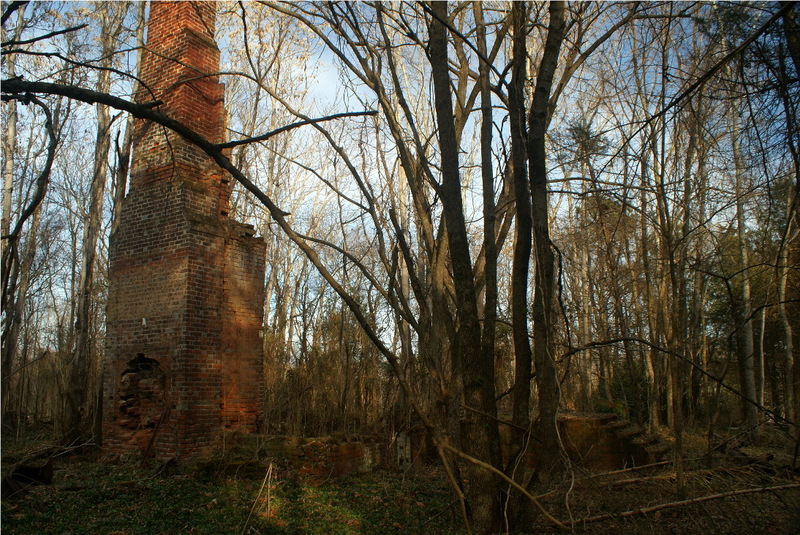 The loss of Ben Lomond was another devastating blow to that part of Goochland. 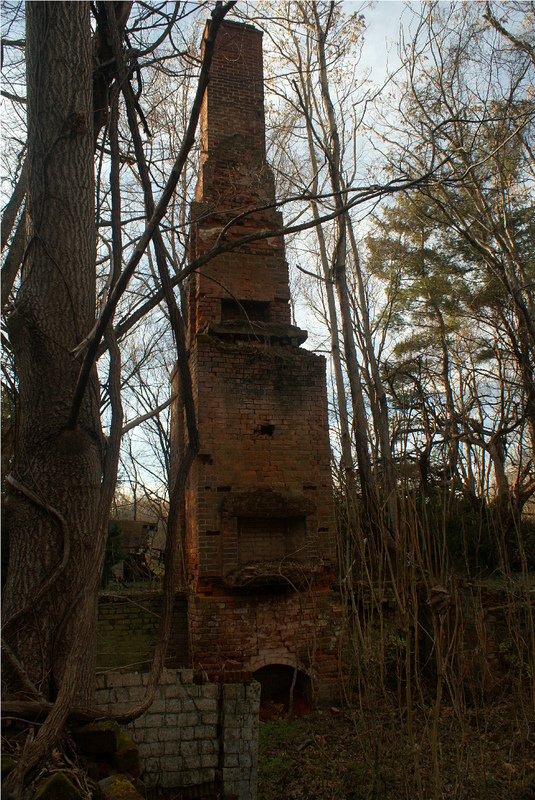 By the time of the fire, the historic area of Rock Castle had already lost Dungeness and Mannsville, both with Randolph connections, and Bolling’s Orapax. Today Ben Lomond survives as a haunting ruin that can only hint at its former glory. To learn more about Ben Lomond: read Volume 3-1 of the Goochland County Historical Society’s magazine. Famed racehorse Sir Archie is considered to be one of the greatest foundation sires in America, his influence is so important that he has been named the “Godolphin Arabian of America”. Foaled at Archibald Cary Randolph’s Ben Lomond farm in Goochland County in 1805, he was sired by Diomed, an Epsom Derby winner and Castianira, owned by Col. John Tayloe III of Mt. Airy in Richmond County, Virginia. Randolph originally named the foal “Robert Burns” but Tayloe changed the name to “Sir Archie” in honor of his friend Archibald. Randolph was renowned for financial problems and these forced the sale of Sir Archie at only 2 years of age. Sir Archie eventually landed in the hands of Col. William Ransom Johnson who trained him into one of the best race horses ever bred in Virginia. His fame brought about his racing end when no opponents could be found to race against him and Jockey Clubs would not let him enter their competitions. 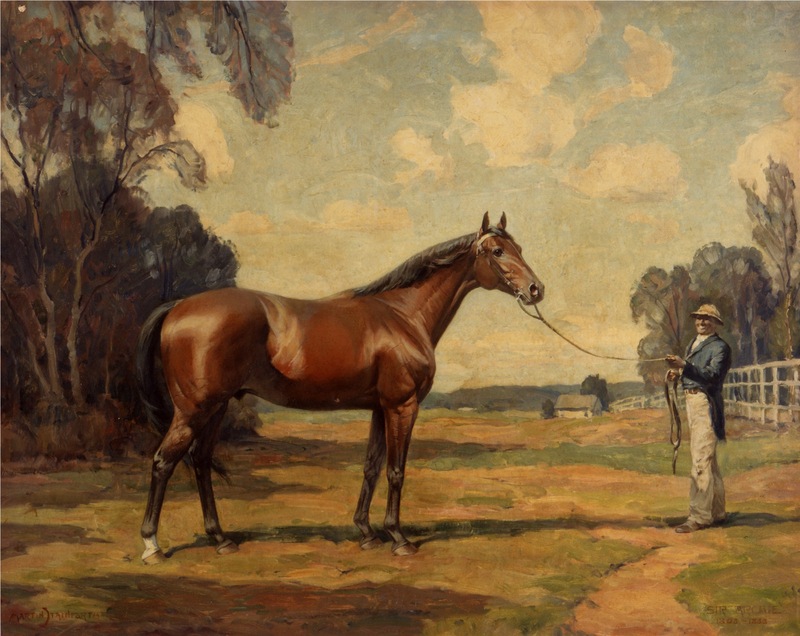 Sir Archie was then put to stud where he stood for 17 years at Mowfield plantation in North Carolina and made in excess of $70,000 for owner William Amis. Much controversy surrounds Sir Archie’s birth and death locations. “The Roanoke Stud” by Fairfax Harrison put his foaling in Cumberland County, Virginia. This inaccuracy was later picked up by Elizabeth Amis Cameron Blanchard in her 1958 book “The Life and Times of Sir Archie”. In December, 1970, a search was made of the Cumberland County records and no record of Archibald Cary Randolph or Ben Lomond was found. Randolph is listed in the Goochland County records and is shown as owning Ben Lomond which is squarely within the bounds of Goochland, thus settling that question. 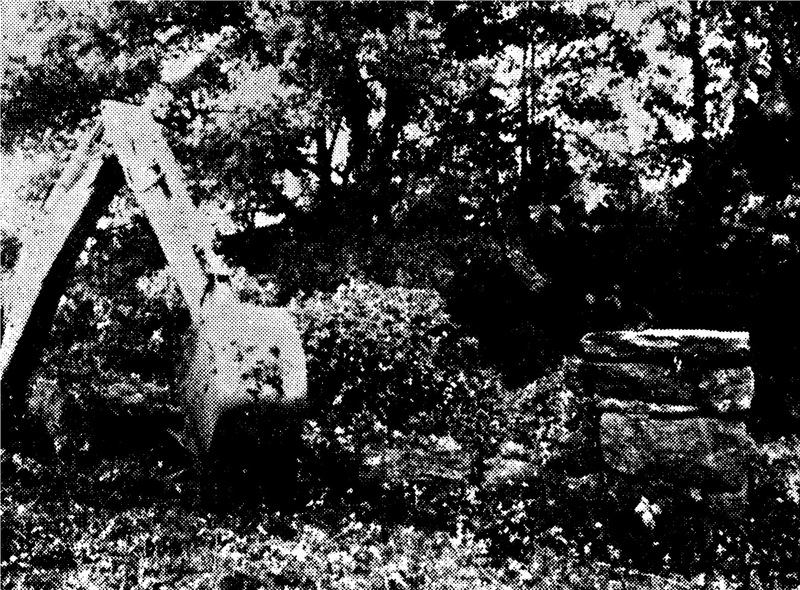 On November 11, 1970, a dig was performed at Ben Lomond by the Historical Society, Masters of the Deep Run Hunt Club and a veterinarian at the supposed Goochland grave of Sir Archie. Horse, human and dog bones were found, however proving them to be Sir Archie would be almost impossible. Similar excavations at Mowfield have found no remains. This mystery will be much harder to solve, however it does still allow both to claim the final resting place of this famous horse. In 1955, Sir Archie became one of the first horses inducted into the U.S. Racing Hall of Fame. He sired 31 champion horses and through son Copperbottom, influenced the American Quarter Horse. His bloodline can still be found in some of the most famous champions of the day. Exciting and mysterious in life as in death, Sir Archie will always be one of Goochland’s favorite sons.